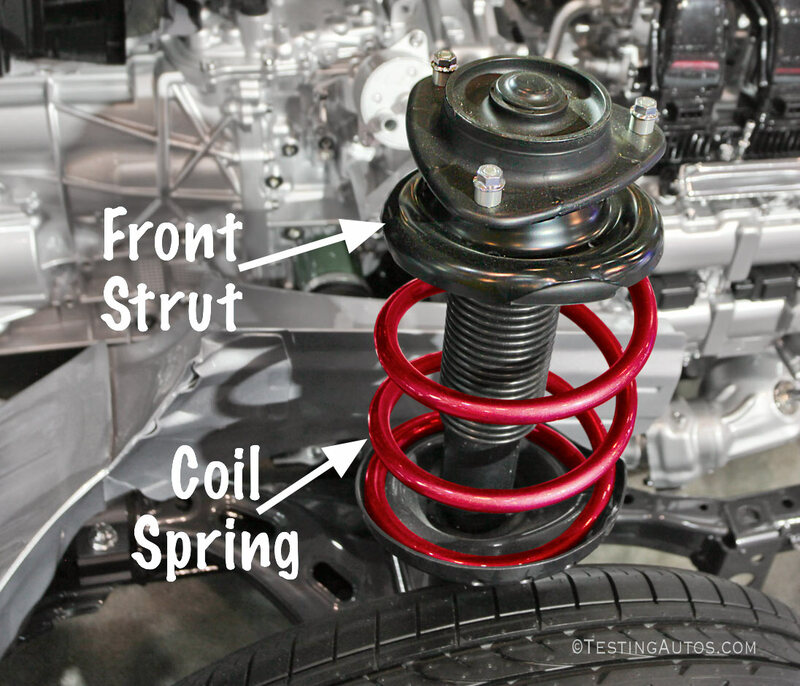 Most cars have 4 coil springs, each supporting one corner of the vehicle. 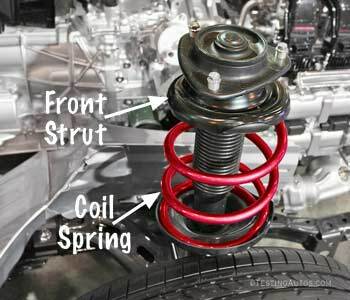 In cars with MacPherson struts, a coil spring is installed within a strut (in the photo). Coil springs don't need any maintenance, but they might need to be replaced. One reason is when a coil spring breaks. A broken coil spring is a safety concern. Not only your suspension is not working as it's supposed to, but a fractured piece of a coil spring can puncture a tire or jam some other part. It can also fall on the road and cause danger to other motorists and pedestrians. A broken coil spring must be replaced. Several car manufacturers issued recalls to replace coil springs. For example, Nissan recalled certain model year 2007-2012 Nissan Versa in Canada and certain regions of the United States to replace both front coil springs. The reason is the salt used on the roads in winter time can cause the springs to corrode and possibly fracture. Hyundai also recalled certain 2011 Elantra and Sonata vehicles for the same reason. If one of your coil springs broke, we suggest to check with the manufacturer or a dealer for possible recalls or safety campaigns related to a coil spring. 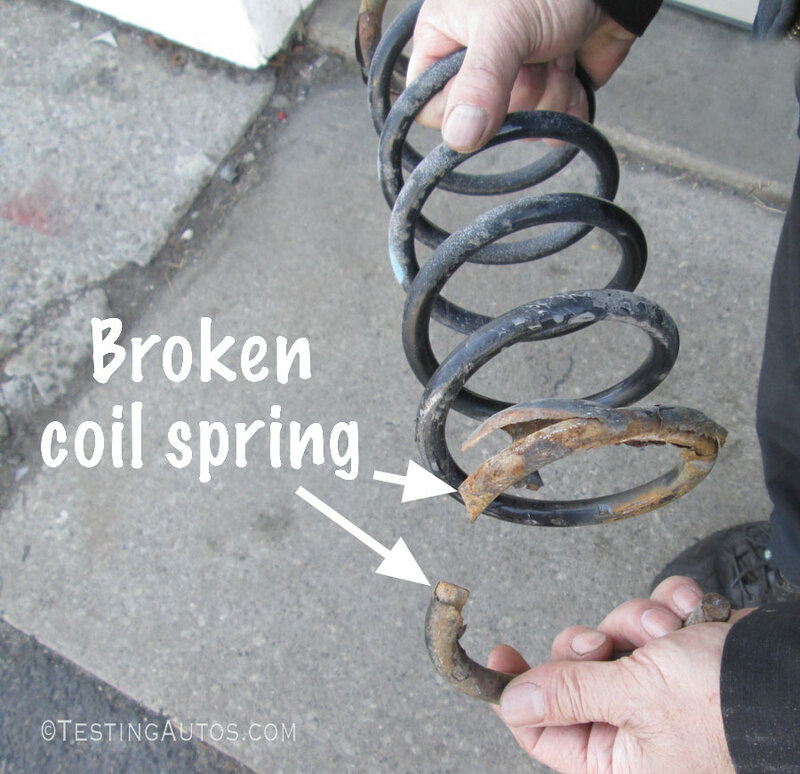 Are there any symptoms of a broken coil spring? 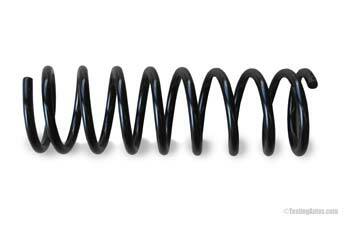 In some cases, a broken piece of the spring can produce a metal rattle when driving over bumps and potholes. The vehicle was making a rattling noise when driving over bumps. Turns out, it was a broken coil spring in the back. The ride height may also appear lower on one side. Most of the time, however, there are no symptoms and a broken coil spring can only be caught during a regular service when the vehicle is lifted on the hoist in a shop. The ride height is another reason why coil springs may need to be replaced. In older cars, coil springs weaken and sag, causing the ride height to be lower. It's often more noticeable at the rear axle of the vehicle. Weak rear coil springs may cause poor handling and increased wear on the inside of the rear tires. In addition, when the rear springs sag, the headlights point higher and can dazzle drivers in oncoming cars. Often, this problem can be caught during the wheel alignment, because sagging coil springs can alter the wheel angles (especially camber) beyond what can be corrected during the wheel alignment. In this case, your mechanic may suggest replacing the rear coil springs, and if needed, other worn-out suspension components to restore the ride height and proper wheel angles. Another common reason to replace coil springs is when they are badly damaged by rust. Should both coil springs on the same axle be replaced at the same time? It's commonly recommended to replace coil springs in pairs. 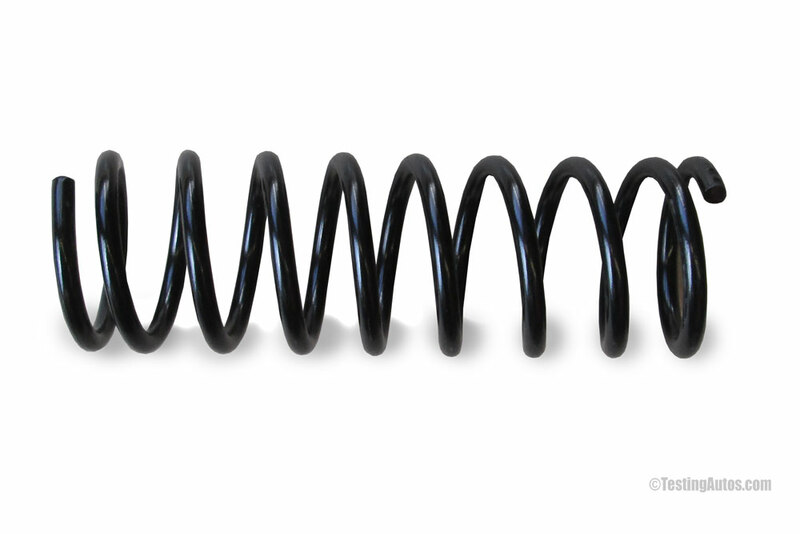 Over time coil springs weaken, so if you replace only one spring, the left and right springs will respond differently to the road and have different ride height. Your mechanic may recommend replacing only one coil spring if the vehicle is fairly new and the replacement spring is a matching OEM part. How much does it cost to replace coil springs? One coil spring (part) costs between $50 and $250. Labor charges vary between $100 and $240 for one spring, depending on the difficulty. To replace a coil spring your mechanic might have to use a special spring compressor. We don't recommend replacing coil springs DIY, because it's not safe. A coil spring is loaded when in place, and can unwind with a lot of force causing injuries.